However, since buying the sport at the beginning of 2017, and clearly unaware of the expression 'quality not quantity', Liberty Media has made no secret of the fact that it is targeting a calendar featuring as many as 25 races. 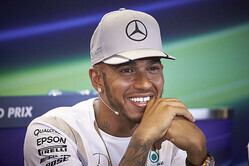 For Lewis Hamilton, this would be a step too far. "It already feels like we are on race 25 this year," said the Briton, just a day after Vietnam was finally unveiled as the latest addition to the schedule, "so I don't think that's a good thing personally. "I think 18 was probably the best back in the day," he added. "I'm someone who really loves racing but the season is long. It's a lot of commitment for all of us and a lot of time away from families and the seasons are getting longer and the off time is getting shorter." Next season sees the action get underway in mid-March, while the final race is in December, and while a number of race contracts come to an end next year - not least that of the British Grand Prix at Silverstone - Liberty's plan to build the calendar is clear. "The turnaround is so short, you start preparing for your next season often as soon as the season is done," said the 33-year-old. "It's most likely I'm not going to be here when it gets to 25 that's for sure." Check out our Thursday gallery from Interlagos, here. Hanoi, a street track with a difference? "No worries. In that car he could skip 5 of the 25 and still take the title home." "And on with the show. I guess..."
"Clearly Liberty expect a few races to fall by the wayside keeping the number of races to around 21-22, but as said in the piece quantity is starting to surpass quality." "I am 100% with Lewis on this, who has the time to devote to watching this much; maybe a separate championship for the far east. Let's have grid girls back and get rid of those embarrassed looking children.Most of the children in the audience seem more interested in wearing team clothing and waving a flag. And while we are about it do we really need the national anthem sung badly. "